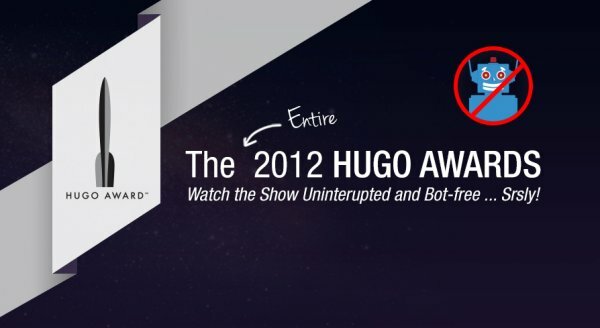 The 2012 Hugo Awards Ceremony, originally staged at Chicon 7, the 2012 Worldcon, on September 2, will be re-broadcast in its entirety and ad-free via UStream on Sunday, September 9, starting at 7 p.m. CT (8 p.m. ET, 5 p.m. PT) at www.ustream.tv/channel/hugo-awards. The original broadcast on UStream was interrupted when UStream’s automated copyright-infringement software detected content deemed to be in violation of copyright. The content (clips of Hugo-Award-nominated dramatic presentations) had been cleared for use as part of the ceremony, but UStream was unable to restart the coverage of the ceremony. UStream founder and CEO Brad Hunstable spoke directly to Chicon 7 Chairman Dave McCarty the day after the 2012 Worldcon ended and apologized for the disruption. UStream will rebroadcast the 2012 Hugo Awards Ceremony without ads or interruption and will work with the Hugo Awards Marketing Committee (which McCarty chairs) and future Worldcons to support future Hugo Award ceremony broadcasts. Further details are in the press release on the Chicon 7 Worldcon web site.